Chocolate raspberry mini cheesecakes, anyone? I realize this post is a bit late for preparing these romantically themed treats in time for that special someone today. Please excuse the tardiness, because this week has been insane. 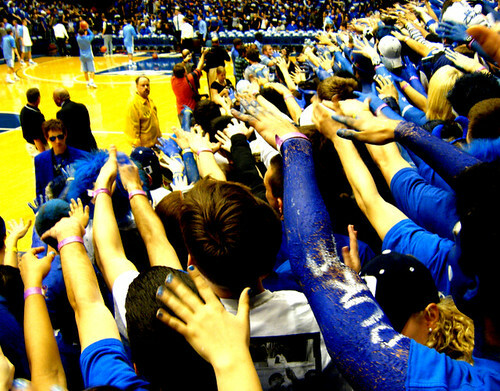 Midterms and the big game just happened to fall within the span of three days. Talk about a whirlwind. Now that the madness is over (for now), let’s get cooking again! 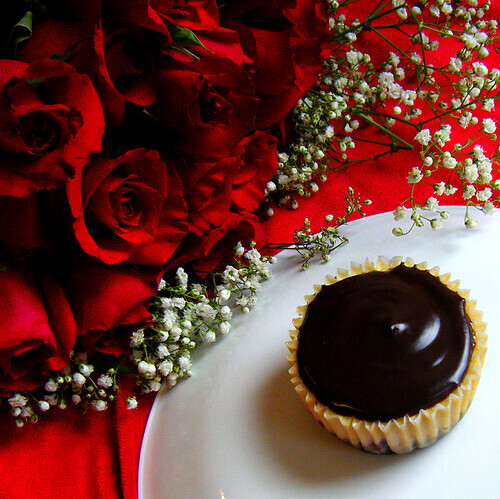 Valentine’s Day is the prime opportunity for showcasing chocolate desserts. I know I’ve been on a chocolate kick for the past, well, month, but stay with me here. 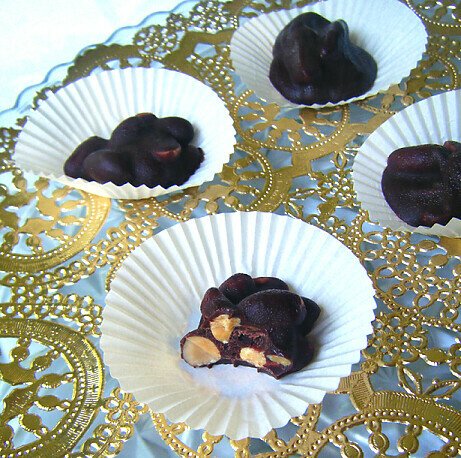 These all natural low carb chocolate truffles are adapted from a recipe by Alton Brown, the television personality slash culinary god that inspired me to start cooking. Silky smooth and rich, with a strong undertone of rum flavoring (which can be omitted… keep reading teetotallers! 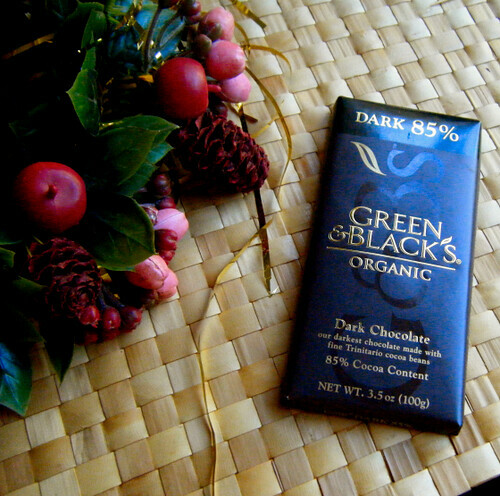 ), they are a pure hit of chocolate to the brain. Because these amazing treats aren’t loaded with sugar, you’ll be satisfied with just a couple rich bites! What’s not to love about that? I will probably omit the rum next time, but my friends certainly enjoyed them! 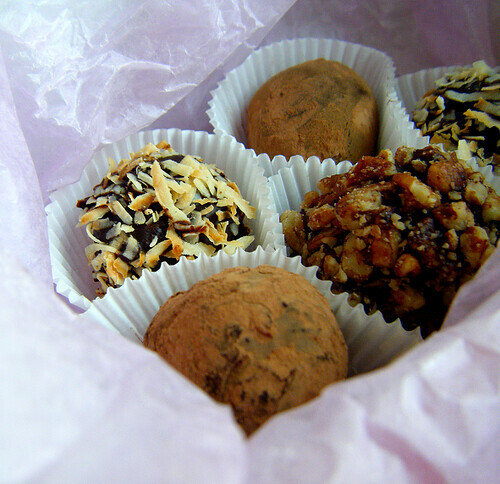 They said the truffles tasted “professional.” Try a batch with and without the alcohol. 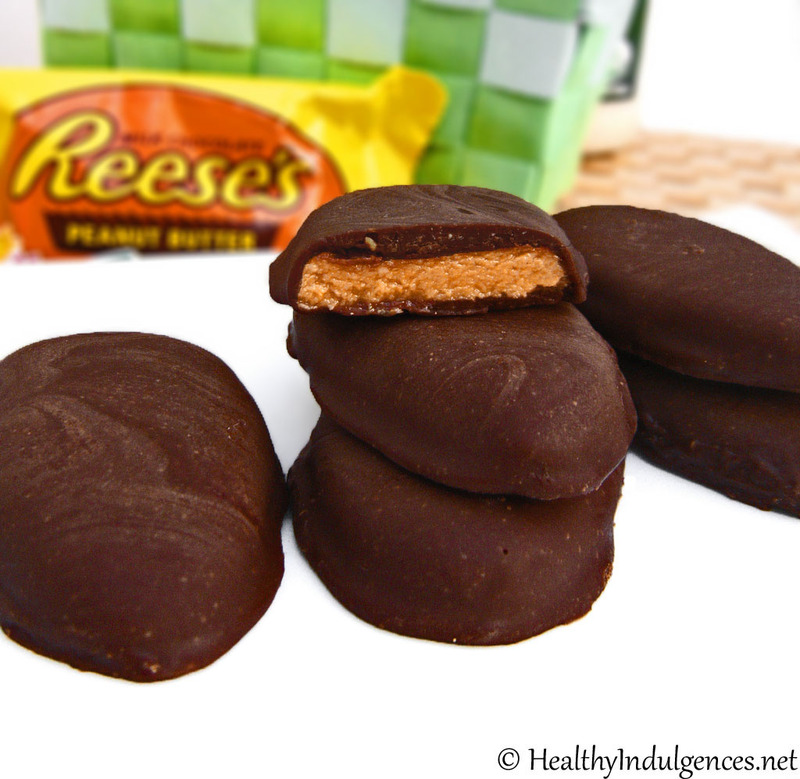 You will want to make these more than once! 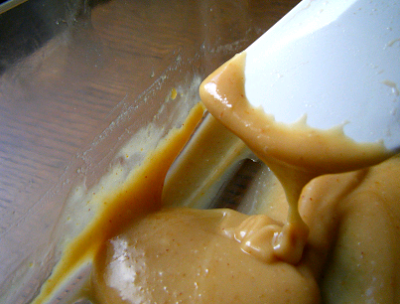 Powder erythritol in a coffee grinder or Magic Bullet blender. Chop up cold butter into small chunks and set aside. Section out the Lindt bars into seven pieces each (I just eyeball it). Each piece is half of an ounce. Count out ten of these pieces. Chop or break up chocolate into small chunks. Add cream and erythritol. Microwave in a heat proof bowl on HIGH for 30 seconds. Remove from microwave and stir until just smooth. Add butter and stir until melted and smooth. Stir in stevia and rum (or vanilla and water). Taste and adjust amount of stevia if necessary, adding 1/16 of a teaspoon until you reach desired level of sweetness. 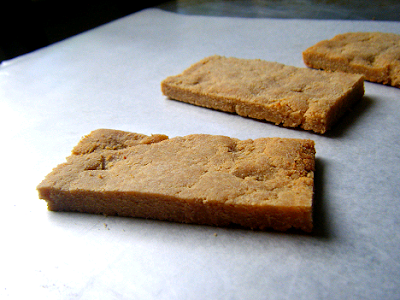 Pour into an 8 by 8 glass dish or other large pan and freeze for 10-20 minutes, or until firm. 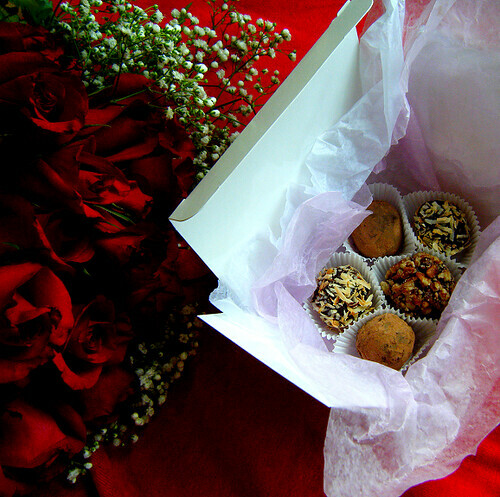 You could alternatively refrigerate filling and roll truffles the next day. Scoop out truffles with a melon baller or teaspoon measure. Roll quickly (rinse hands under ice water and dry off) into balls, and set on cookie sheet lined with wax paper. Your hands might get a bit messy if you don’t wear gloves. Freeze for five minutes while preparing coatings. For a quick and easy coating, just roll the naked truffles in sifted cocoa powder. For a nice thin chocolate coating that keeps well at room temperature, melt the chopped 70% chocolate bar until smooth, then add stevia to taste, starting with 1/8 teaspoon. 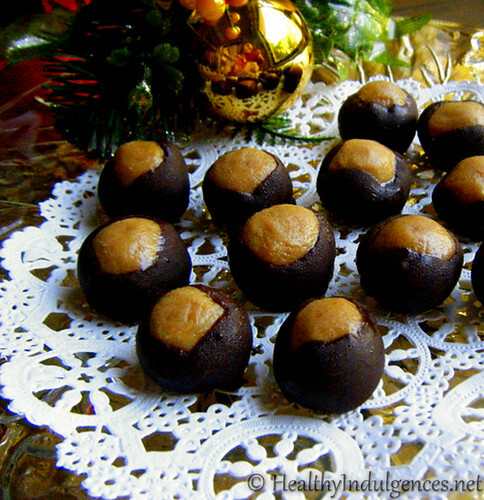 Dip cold truffle fillings into chocolate with a fork, them immediately roll in nuts, coconut or cocoa powder. You could also just leave the chocolate coating plan. Store refrigerated in an airtight container in the fridge, or on the counter top for 24 hours. Serve at room temperature. 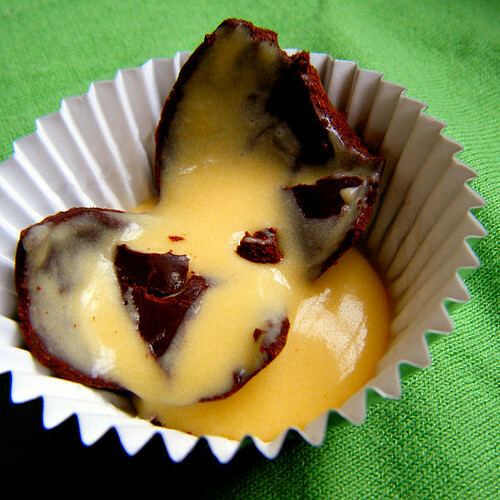 Recipe for the Mini Chocolate Raspberry Cheesecakes coming tomorrow. I have to go get ready to celebrate Valentine’s day. Apologies! I decided to enter a contest and need to save this recipe for next month! There are certain flavors that you miss when you strip your diet of most processed foods and sugar. Most cravings can be satisfied with natural foods, but particular taste memories require you to get creative. 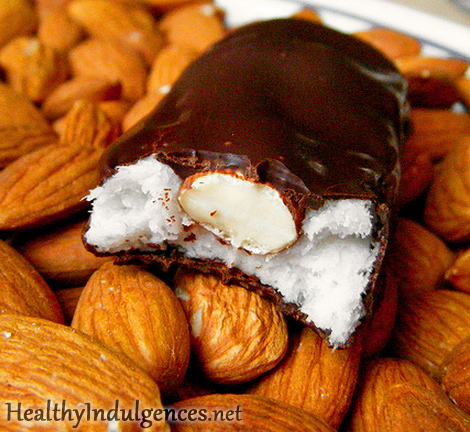 One of my absolute favorite candy bars was the Almond Joy candy bar, a chocolate coated candy bar with a sticky sweet coconut filling (known as a Mounds bar minus the almonds). My roommate, Bethany, reminded me of this old obsession a couple of nights ago when we were having a quiet night in, doing homework and socializing in the dorm kitchen. 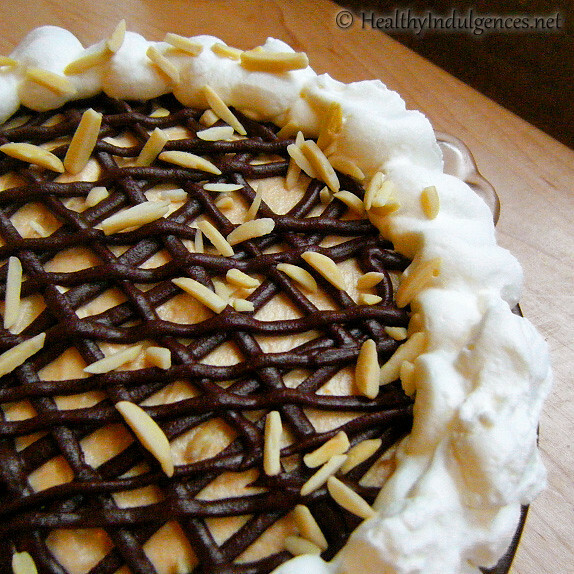 I brainstormed how to recreate the gooey coconut filling sans the sugar. Coconut oil, coconut milk, and unsweetened coconut would add plenty of fresh coconut flavor and moisture to the filling. A blend of natural sweeteners–stevia and erythritol–would add sweetness without the carbohydrates. I came up with a test batch and ceremoniously handed Bethany one of the freshly coated treats on a tiny paper plate. Moments later, she gave me a chocolate covered thumbs up. We had a winner! 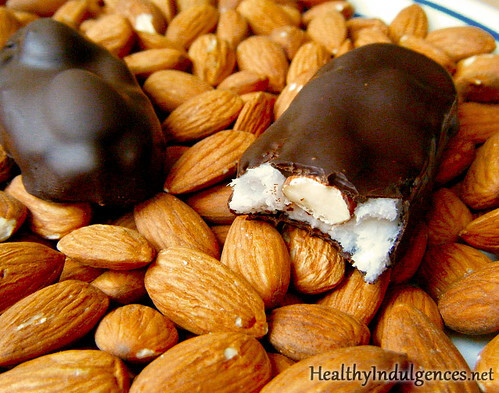 Real Almond Joy bars contain two types of sugar (corn syrup and white sugar) and two different transfats (partially hydrogenated soybean oil and partially hydrogenated cottonseed oil). Just one candy bar has a whopping 25 grams net carbs! 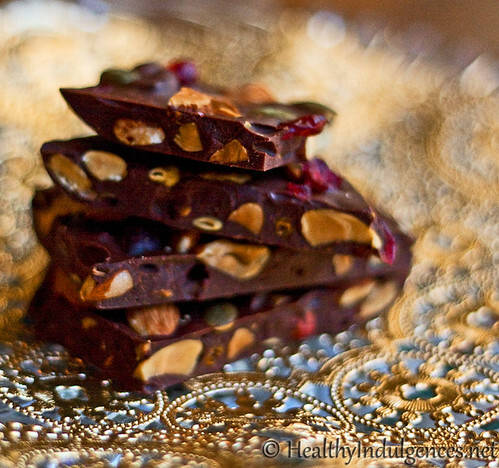 These homemade gluten-free, low carb candy bars will boost your immune system and fuel your cells as opposed to breaking them down. Since they contain no dairy, these treats are incidentally vegan. As one helpful reader pointed out, these candy bars are nearly sugar-free as the Lindt chocolate in the coating contains just 19g net carbs (for the whole 85% bar) or 35g net carbs (for the whole 70% bar). 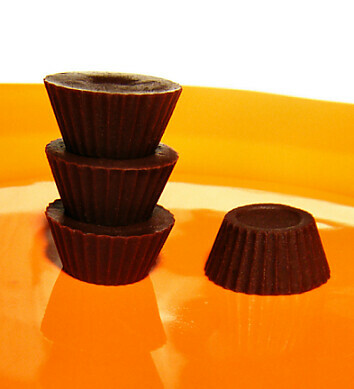 The amount of sugar per serving is low enough to incorporate into my healthy eating plan, but if it is important for you to go totally sugar-free, try experimenting with unsweetened chocolate. 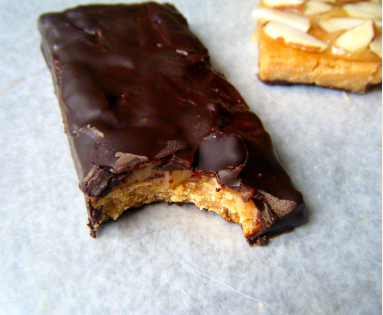 Update: If you’d like the coating to be totally sugar-free, try melting down a Lily’s sugar-free chocolate bar. They’re super yummy and available for purchase Whole Foods supermarkets. You can coat these bars in a snap with 70% cacao content chocolate, or make up a chocolate ganache to lower the carb content. The only problem with the ganache is that it is thicker and must be stored in the freezer to remain firm. Both coatings taste equally delicious, though! You can make these sugar-free (recommended for diabetics) or paleo by using your preferred sweeteners. This recipe is flexible, so play around with it! Be aware that if you use honey, the flavor of it will compete with the coconut and chocolate, so it won’t taste exactly like the traditional candy bar, but it’ll still be yummy! 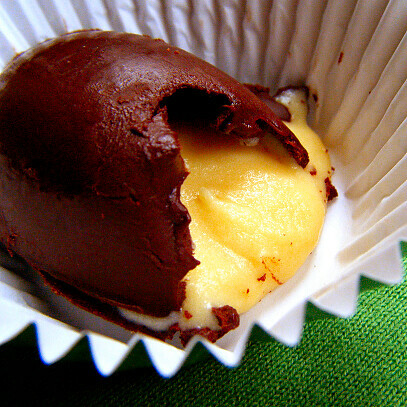 You can’t really go wrong with a sweet coconut filling enveloped in chocolate, now can you? 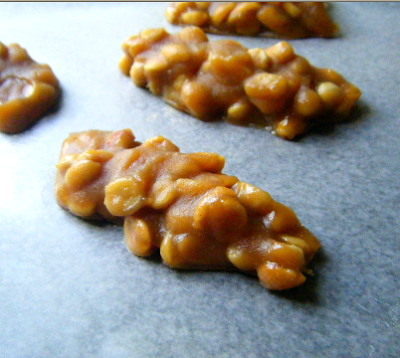 Chill a cookie sheet lined with wax or parchment paper in the freezer or fridge while you are prepping the candy filling. If you are making sugar-free candies, start by grinding the erythritol, xylitol, and sea salt into a fine powder using a coffee grinder. Whisk together coconut oil, coconut milk, unsweetened coconut, and honey (for the paleo version) or powdered sweeteners until you form a smooth paste. Add stevia, a little at a time, tasting for sweetness. Add more stevia if necessary. If you use one of the recommended brands, the listed quantity should provide just the right amount of non-bitter sweetness! Drop dollops of the coconut mixture on to aluminum foil or waxed paper, and shape into flat logs with your fingertips. 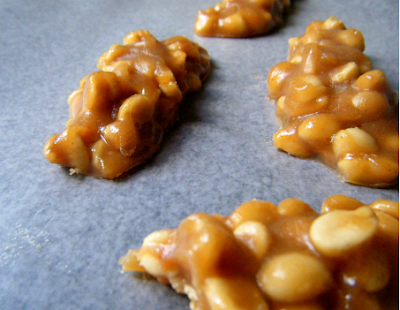 Top with almonds, pressing the nuts down gently into the filling. Freeze filling on cookie sheet for 5 minutes, or until it is firm and cold. 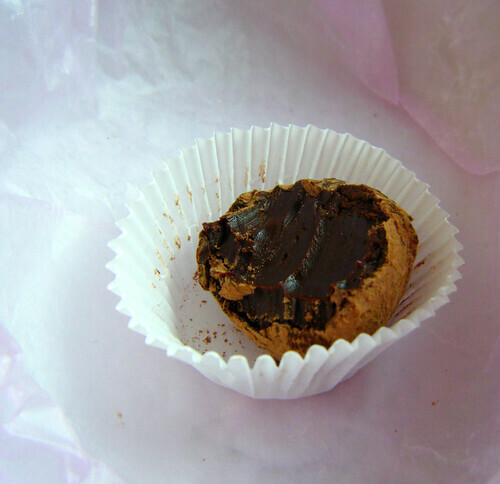 Microwave chopped chocolate for 30 seconds on HIGH, and stir until smooth. Add 1/16 teaspoon of stevia and taste. Adjust sweetness level if necessary. Stick toothpicks into cold filling logs. 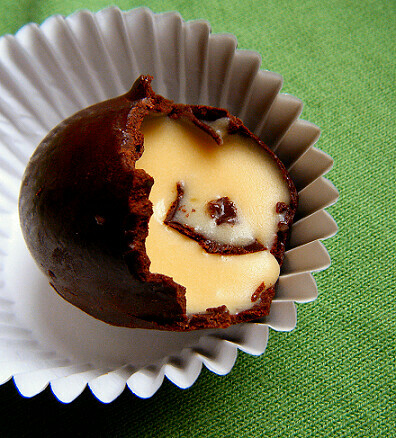 Dip filling log into chocolate, return to wax paper, and remove toothpick. Wait a minute or two for chocolate coating to harden, and enjoy! *If you are making the filling with sugar-free sweeteners, I recommended using erythritol with a tablespoon of xylitol mixed in. 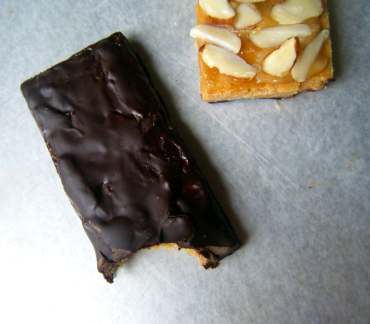 To learn why I always combine sweeteners, check out the Healthy Indulgences E-Cookbook! 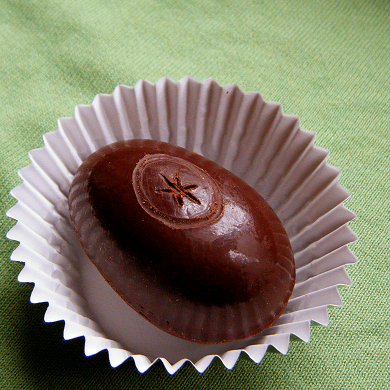 **You can use sugar-free chocolate for the coating, like Lily’s, if you are trying to completely avoid sugar. 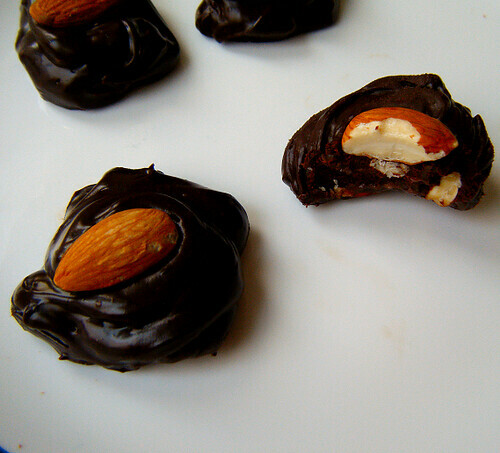 I made quick nut clusters by dipping raw almonds into the ganache. Grab one from the freezer when you feel a chocolate craving coming on! Grind erythritol to the consistency of powdered sugar (see this post) in coffee grinder or Magic Bullet. Chop chocolate and combine with erythritol and cream. Microwave for 30 seconds on HIGH and stir until smooth. Add a couple more tablespoons of heavy cream if coating is too thick. Stir in stevia, and taste. Adjust sweetness level if necessary. 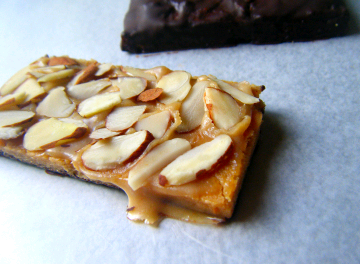 Use for nut clusters, Almond Joy bars, topping cupcakes… whatever you like! 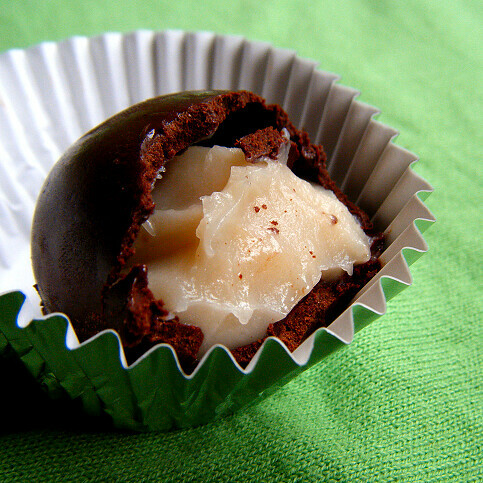 Store candies made with ganache in the freezer.